Cheerful sunflowers combined with orange carnations and red mastamoto asters make for a wonderful gift no matter what the occasion. 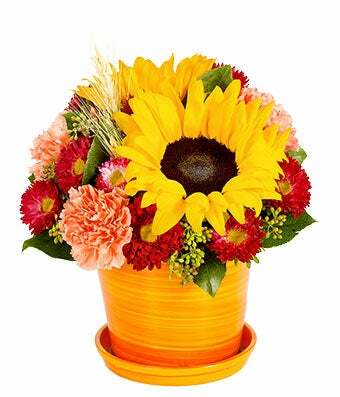 Availble for the same-day, the bouquet is situated in an orange pot container. Arranged by a local florist, the Sweet Sunflower Bouquetn will be sure to bring sunshine and delight to your recipient's day. Measures 10"H X 8"L.